The Congressional Budget Office’s latest debt and deficit projections for the next ten years are out and there’s no way any honest analyst could read them as anything but the official end to any rational concern about red ink. Of course, given that the phantasmic plays such a large role in politics, it’s likely that important people will still worry about fiscal ruin. But to the degree that reality exerts even a weak gravitational pull on discourse, it should be harder to generate the sense of emergency that austerians thrive on. Because revenues, under current law, are projected to rise more rapidly than spending in the next two years, deficits in CBO’s baseline projections continue to shrink, falling to 2.1 percent of GDP by 2015. The graph shows the sharp rise in the debt/GDP ratio that came with the Great Recession is nearly over, and the line is about to go flat—flat at a level well below the now-discredited 90% danger level that Carmen Reinhart and Kenneth Rogoff got people all worried about until their work was exposed as bogus. 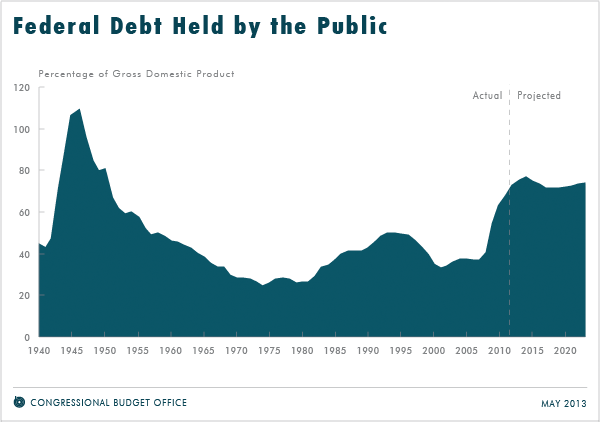 According to the spreadsheet that accompanies this release, the CBO projects the 2023 federal debt/GDP ratio to be 73.60%, down from 75.07% today. (You gotta love projections for ten years hence that are carried out to two decimal places.) Over the next 10 years, they project revenues to rise by 1.6 percentage points of GDP, and spending to rise by 1.0 points, for a (rounded) shrinkage in the deficit of 0.5 points. (Before rounding, the decline is 0.547774045234583 points, a hilarious level of precision.) The CBO projects this year’s deficit at 4.0% of GDP, which is very close to the 3.0% that many orthodox analysts regard as trivial. The spending projections for the next decade are quite austere. Social Security’s share of GDP is slated to rise by 0.4 percentage points, and health spending (Medicare, Medicaid, etc.) by 1.0 point, but other major spending categories will decline. Mandatory spending other than Social Security and health will fall by 0.4 points; military spending, by 1.2 points; and civilian discretionary spending (which includes much of the civilizing stuff, like education and environment), by 0.9%. Whether that level of austerity is politically sustainable is an open question—people purport to hate government spending in the abstract, but when it gets down to specifics, the politics get a lot rougher. But these projections are basically what will happen if we continue on the path set by current law. This being American politics, it’s time to bring the rational, evidence-based portion of this post to a close. Austerians are driven by a mix of irrational anxiety and a desire to take benefits away from all but the rich. Benefits create expectations, and dilute the power of labor market discipline, both of which are potentially explosive. People don’t like to have things taken away from them, so it helps to create a sense of emergency to lubricate the process. So what will the fiscal sadists do? The CBO itself offers a hint of how to maintain deficit hysteria—the deficit will rise from 2020 to 2023, and could get really bad in the late 2020s (though they don’t provide any numbers). Egads! But the rise in the debt/GDP ratio from 2020 to 2023 is all of 2.2 percentage points, to a level still below today’s—and projections 15 or 20 years into the future are a thin support for drastic action today. (This is further proof of the rule that one should always read the numbers before the prose in official reports like these.) But that doesn’t mean fiscal hawks won’t piss and moan. They will. But their emoting will either have to get even more phantasmic—or more nakedly class war-ish. If only we could get important people to show this level of long-term anxiety about atmospheric CO2.